Cook: Lunch Bunch | CookDrinkFeast! Some of my co-workers and I decided to do a communal lunch instead of buying lunch every day. 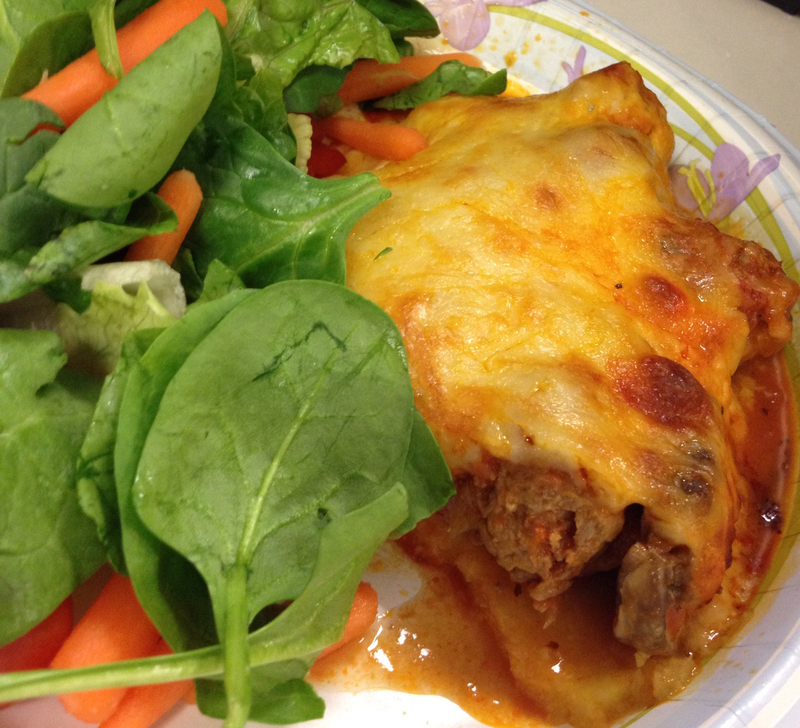 We figured that a home-made lunch would be easier on both the wallet and the waistline. Each of us has a day to bring lunch for the rest of the group. Wednesday is my day. This past Tuesday night, I was stuck for something to bring. I am currently taking my capstone classes for grad school. Between work & school, I’m going full tilt. I needed something simple and fast. I decided to do a cross between a casserole & a lasagna. I bought a pre-cooked roll of polenta (It looks somewhat like a package of sausage) and topped it with turkey sausage, mushrooms, marinara sauce, and mozzarella cheese. I also made a huge green salad. Spray 9 x 13 x 2 inch baking dish with nonstick spray. Slice polenta crosswise into ¼-½ inch rounds. Place rounds in one layer on the bottom of the baking dish. Slice turkey sausage links crosswise into ½ inch thick rounds. Heat a large pot over medium high heat. Add olive oil. Once olive oil starts to shimmer, add sliced turkey sausage and mushrooms. Saute until turkey sausage is almost cooked through. Add pasta sauce and heat through. Pour sauce mixture over polenta rounds in the baking dish. Sprinkle shredded mozzarella cheese evenly over the top of the sauce mixture. casserole in the oven and bake until cheese is melted, golden brown, and bubbly — about 30 minutes. Let cool 5 minutes before slicing and serving. Thanks Morgan! It’s fast and easy so it makes a great weeknight meal.